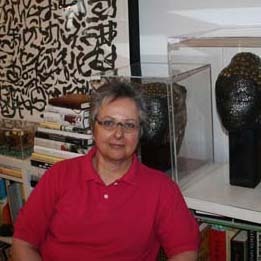 Catherine Eckdahl is a painter, sculptor, draftsman, printmaker, weaver, and more. Her work is influenced by Persian, Indian, Chinese and Japanese calligraphy as seen in illuminated manuscripts, books, murals and textiles. Other influences include pictograms and ideograms of ancient cultures, contemporary graffiti and other systems of language. Eckdale’s work has evolved from years of doing handwritten faux scripts from Asian languages, each having their own characters and movements when written. The language and rhythm had to be practiced so it wouldn’t become an imitation. She then combines these rhythms making the words disappear to create bold, gestured abstractions.